Siobhan scribbled it down, beaming. At those times, Siobhan wished she did do spells. The prompt was to “create a recipe of a dish fit for a witch – from Julia. I want some of those brownies now. Yum! Great piece, really get’s across how it feels to be misunderstood. Thanks. I hoped it did. I hope I can make myself some brownies or something at the end of the week. I’m dying for something sweet and good. The magic spell of a family recipe is always a good thing, right? Yes, if you can get at it without cattiness creeping in. What a fun take on the prompt. Brownies, now they really are magic. As always, a piece that I am glad that I read. Sounds delicious. I’m sure Wiccans often wish they could cast spells :-). I found a site that says some do and some don’t. I guess the ones who do just aren’t interested in proving it to folks like us. Thanks for the heads up on the gaffe. I’m off to check it now. 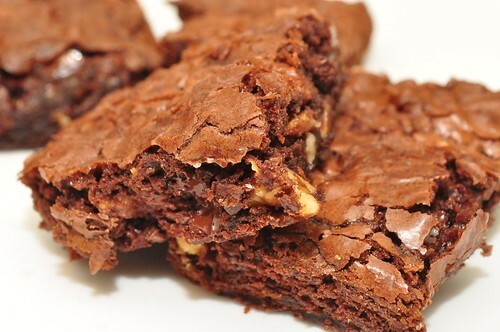 People are really getting into the delicious decadence of the brownies — maybe it’s that photo. It makes my mouth water, too. And here I was thinking I wrote a story about how intolerance tiptoes in when we least expect it. I guess brownies trump intolerance. I did get that part, and it came across well. 🙂 I think brownies trump all, though! Hmm, the word “brownies” must have a meaning I don’t know about. I’m almost afraid to find out. Fun. I like that it’s actually quite light and frothy! I didn’t view it that way as I wrote it, but I’m glad you enjoyed it. Thanks for visiting. These characters really come alive. Love this one!! !